Originally appointed as Independent Tenant's Adviser to 8 of the 31 Local Housing Organisations involved in the Glasgow City Council stock transfer (2000 to 2002), we were subsequently retained to work with them for the next three years to develop their investment and housing management strategies. The organisations we worked with contained over 30 high-rise blocks across the city. 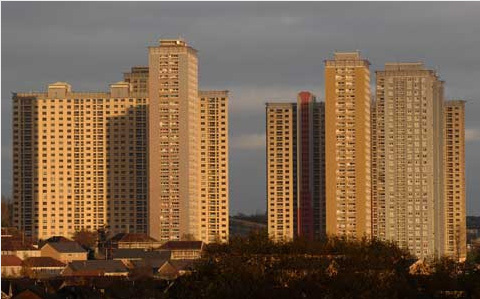 These included, what are generally regarded as, the most difficult to manage and let clusters of high rise blocks- the Red Road flats in Springburn and the Sighthill blocks (which also have the highest proportion of asylum seekers and refugees in the UK). We also supported the development of strategies for Dalmarnock, Drumchapel, and Easterhouse, which contain more than 15 high rise blocks.